Looking for upscale displays at a downscale price, then consider the attractive and affordable Sacagawea Portable Hybrid Table Top Displays from Classic Exhibits. The Sacagawea Custom Modular Hybrid Displays assembles in about 15 minutes with no tools, packs in a portable roto-molded case, and comes with two halogen lights. If you need to be noticed, but without the big price tag, then check out the line of Sacagawea table top disiplays from Classic. 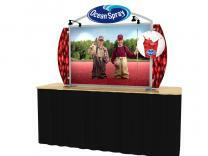 Hybrid displays, such as the Aero line of table top displays, have entered the market with a bang and a lot of flair. 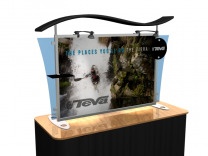 These hybrids combine light weight aluminum extrusions with dye-sublimated fabrics to create convention displays with cutting edge features and high end looks; and with manufacturer’s ability to bend and shape aluminum tubing, there are infinite shapes and infinite looks that can be achieved with the new display products. Out of all the suppliers of trade show exhibit graphics in the trade show industry, Optima Graphics has distinguished themselves when it comes to the skill they utilize in delivering products and services to their retailers. But how are they different? First and foremost, Optima understands their customer’s needs, both as a customer, and a business partner, with a focus on the long term goals of the respective businesses and not the day to day challenges. Optimas' goal is to deliver both relationships to retailers in a manner that makes them the preferred vendor in their respective market. By carefully planning not only future product roll outs, and keeping distributors informed of current trends, has allowed Optima the capacity to make the relationship in the present, an pleasurable challenge. Years ago, it was Optimas' bold move into the Lambda printing technology which is used in photo murals for pop up displays, that really got everyone's attention in the display industry. They've brought dozens of new display products to market like Compass and Sales Mate Table Top Displays, and the Xpressions pop up displays just to name a few. Nobody else in the trade show exhibit industry has had a positive effect like Optima has. One of the front runners in the online retailers of trade show displays, ShopForExhibits.com, continues to expand what they make available to their nationwide clientele, through their display rentals program which was begun only two short years ago, and the new tension fabric products. In order to support the business increase which they forecast for the future, SFE has recently gone live with a new web site that delivers an enhanced level of client support in the way of video demos and enhanced product support. As a result of the recent economic climate, that is anything but predictable, online retailers have to be flexible in what they offer exhibitors as well has being aware of the declining price point that organizations are willing to pay for trade show related merchandise. 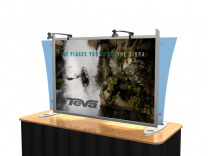 Many people in the trade show business will struggle in the coming months to successfully market new offerings such as custom modular hybrid displays, but because of their years of experience in the exhibit industry, coupled with their competitive web site skills, SFE appears to have what it takes to lead the pack.